Each month, Everett Tree Service hosts two charity days at our location. Each month one of these charity days is dedicated to Warmth for Wake, an outreach program sponsored by Wake County that provides wood for low income residents to heat their homes during the cold months of October through March. 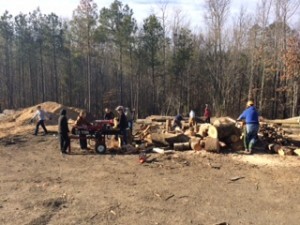 Everett provides the material, equipment and location and volunteers come out to help cut, chop, stack and transport the wood. We are always looking for more volunteers so if you are interested, please contact Warmth for Wake through their website! 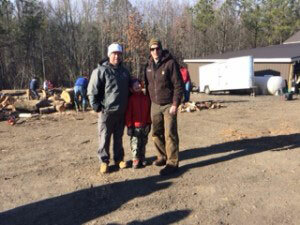 In the photos below, you will see owner Jimmy Everett, arborist Andrew Wharton and Gus Wharton volunteering their time to help out! Thank you for visiting the new website for Everett Tree Service! 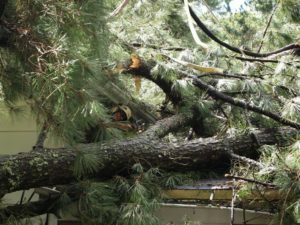 We hope you learned a lot about our residential and commercial tree services, including tree trimming, storm recovery, tree removal, stump grinding and mulch. We are proud to serve the Raleigh area, including Cary, Chapel Hill, Durham and the whole Triangle with our services. We will use this blog to post updates about recent projects, industry news, events we participate in and other pertinent information. Please check back often to keep up to date and contact us with any questions.